Interstate 894 provides a bypass to the southwest of Milwaukee while acting as a commuter route to several major suburbs. I-894 is co-signed with both Interstates 41 & 43 on the East-West part of the Bypass. That portion is known as the Airport Freeway. The north-south portion is the Zoo Freeway, and it is signed as Interstates 41 & 894 and U.S. 45. Major interchanges in the Milwaukee area are formally named. Those along I-894 include the Zoo Interchange with I-41-U.S. 45 and I-94, named for adjacent Milwaukee County Zoo; the Hale Interchange with I-43 leading southwest from Hale Corners; and the Mitchell Interchange with I-94, derived from nearby General Mitchell International Airport (MKE). Starting in 2012, an overhaul at the Zoo Interchange reconfigured the exchange to eliminate left exits in all directions. 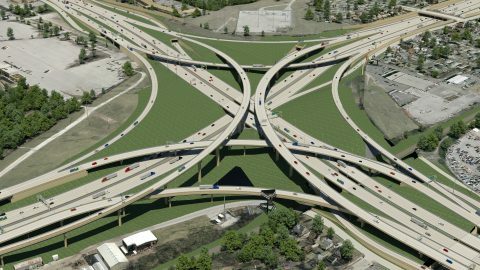 The centerpiece of the largest transportation project in Wisconsin state history was the construction of a four-level systems interchange at Interstates 41, 94 and 894. The $1.7-billion project also rebuilt I-94 west to South 108th Street (Exit 304), I-94 east to South 84th Street (Exit 306), I-41 north to Watertown Plank Road (Exit 40) and I-41/894 south to Greenfield Avenue (Exit 1D). The associated roadways leading to and from the Zoo Interchange were upgraded to remove weaving traffic patterns. Photos from the Zoo Interchange Project (I-41/I-94/I-894). The $1.7 billion project to reconstruct Wisconsin's busiest interchange just reached its halfway point. 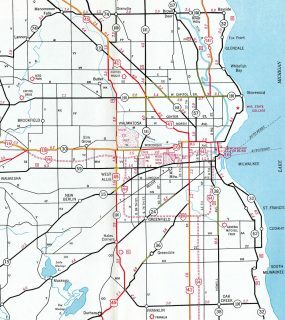 The U.S. 45 (I-41 now) portion of the Zoo Freeway north of I-94 was not shown on the 1961 Official Highway Map. The freeway was built northward to North Avenue in conjunction with the initial stretch of I-894 south by 1963. Interstate 894 in 1971. 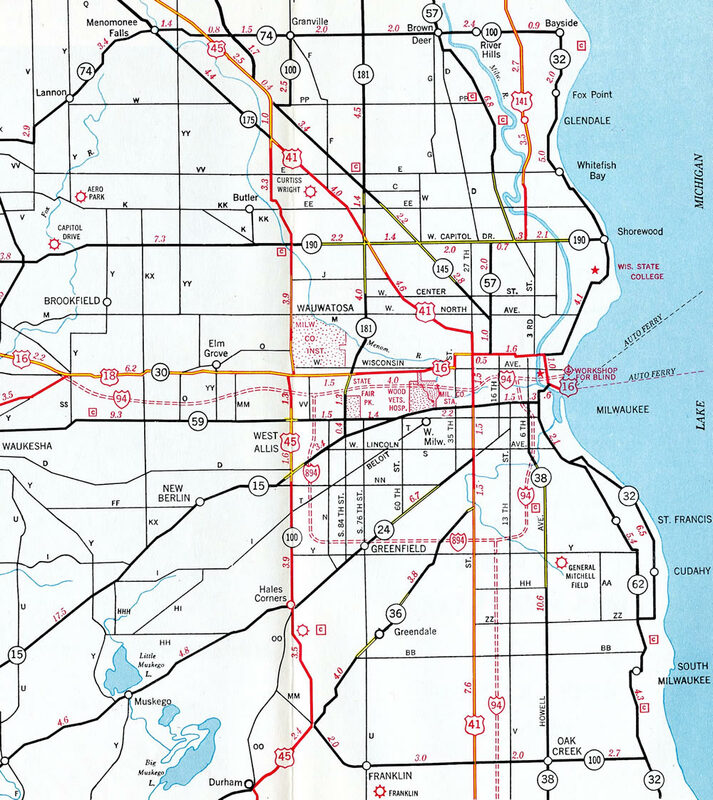 Note that Wisconsin 15 overlapped with the Zoo Freeway north from Rock Freeway (Hale Interchange) to National Avenue (Exit 2A). The state trunk highway was decommissioned in 1987 with the extension of I-43 south. Original plans took the Stadium Freeway south from National Avenue to Interstate 894 (Airport Freeway). The directional T interchange with I-894 was partially completed and a portion of it later repurposed as bus ramps to the Loomis Road Park & Ride lot. Those ramps were permanently closed in 2011. Interstate 43 combines with U.S. 45 south on the Rock Freeway as I-41 &amp; 894 turn north onto the Zoo Freeway at the Hale Interchange. Photo taken 06/13/15. Escalating construction costs in 2003 associated with the massive rebuild of the Marquette Interchange in Downtown Milwaukee, where Interstates 43, 94 and 794 come together, included several cost cutting ideas touted by then major John Norquist. A scaled down interchange revamp developed by city engineers would save $361 million by only moving one of the left-hand ramps at the busy Downtown junction. Coupled with that was a renumbering plan proposed by the mayor that might offset traffic through the exchange. The plan included rerouting Interstate 94 over all of Interstate 894, extending Interstate 794 west from the Marquette Interchange to the Zoo Interchange over former I-94, and leaving the North-South Freeway as simply Interstate 43.2 This proposed renumbering was never implemented and the Marquette Interchange was ultimately rebuilt between 2005 and December 2008. Interstate 41 was approved by AASHTO on November 15, 2012. Signs for the route were erected starting in May 2015. The designation replaces the entirety of U.S. 41 between Rosecrans, Illinois and Green Bay, Wisconsin. I-41 overlays all of I-894, but there are no plans to decommission the 894 designation due to its role as a through route bypass for I-94. 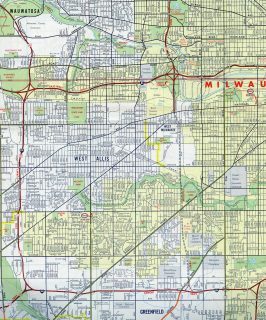 The three way overlap between I-41, 43 and 894 along the Airport Freeway results in a “wrong way” overlap where I-41 north travels along side I-43 south and vice versa. Passing over South 5th Street, drivers along Interstates 41-43-894 see the first sign for the upcoming Mitchell Interchange (Exits 10A/B) with Interstate 94. Photo taken 06/13/15. Continuing east from the Wisconsin 36 (Loomis Road) parclo interchange, Interstates 41-43-894 pass through the partially built interchange for the Stadium Freeway on the one mile approach to Interstate 94. Photo taken by Peter Johnson (07/05/16). The six-ramp parclo interchange (Exit 9) with Wisconsin 241 (27th Street) was redesigned as part of the Mitchell Interchange project. The adjacent on-ramp joins the northbound ramp of I-43 onto I-94 west while the mainline defaults I-41 south onto I-94 east to the left. Photo taken by Peter Johnson (07/05/16). Four lanes of Interstate 894 pass below Wisconsin 241 (27th Street) and associated ramps with Exit 9. Interstate 41 turns south with three lanes to merge with I-94 to its terminus at Rosecrans, Illinois, just south of the Wisconsin state line. Photo taken 06/13/15. Signs for Interstate 41 began to appear throughout Wisconsin in May 2015. The route wholly replaced U.S. 41, including the lengthy overlap with I-94 leading south to the Tri State Tollway in northern Illinois. This was done for continuity purposes. Photo taken by Peter Johnson (07/05/16). A ramp connecting Wisconsin 241 (27th Street) to I-894 west passes overhead as the mainline comes to within one mile of Wisconsin 119 east (Exit 318) and College Avenue (Exit 319). Wisconsin 119 is a short freeway joining I-41 south & 94 east with General Mitchell International Airport (MKE) while College Avenue runs east to Wisconsin 794 (Pennsylvania Avenue) and west to Wisconsin 36 (Loomis Road) near Glendale. Photo taken by Peter Johnson (07/05/16). A sweeping two-lane ramp takes Interstate 43 north onto Interstate 94 west for a six mile concurrency to the Marquette Interchange in Downtown Milwaukee. I-43 travels north from Milwaukee to Port Washington, Sheboygan, Manitowoc and ultimately Green Bay. Photo taken 06/13/15. The Interstate 43 continuation onto Interstate 94 west utilizes one of the two Mitchell Interchange tunnels. This ramp replaced a left-hand merge with I-94 east. Photo taken 06/13/15. The initial sign for the Mitchell Interchange was posted previously within the scuttled Stadium Interchange along I-43 north & 894 east. The departure point of Exits 10A/B was moved further west to below the Wisconsin 241 (27th Street) overpass during 2009-12 construction. Photo taken 09/02/05. Originally two lanes took I-43 north onto I-94 west & U.S. 41 north to Downtown Milwaukee while two lanes carried motorists onto I-94 & U.S. 41 south toward Chicago, Illinois. This scene changed dramatically with the revamp of Exit 9 into a directional interchange and expansion of the Airport Freeway to eight overall lanes. Photo taken 09/02/05. The diagrammatic sign posted at Exit 9 was replaced by separate panels to include an exit only placard for Exit 10A. Photo taken 05/09/10. The roadways of Interstates 43 & 894 separated ahead of the South 20th Street overpass for the original tri-level stack interchange with Interstate 94 & U.S. 41. Photo taken 09/02/05. Additional sign changes were made during early stages of the Mitchell Interchange construction for Interstates 43 north & 894 east ahead of Interstate 94 & U.S. 41. Photo taken 05/09/10. Like Interstate 794, Interstate 894 was also signed with an end shield. Four sets of roadways pass under 20th Street in this scene now. Photo taken 09/02/05. Interstate 894 ended at the separation of Exits 10A/B for I-43 north & 94 west to Downtown and I-94 east to Oak Creek, Caledonia and Chicago. U.S. 41 previously overlapped with I-94 northward to Exit 308, but was relocated to a hidden overlap with I-894 with the signing of Interstate 41 in 2015. Photo taken 09/02/05. The first sign for the Mitchell Interchange and split of Interstates 41 and 94 appears within the diamond interchange (Exit 320) at Rawson Avenue. Photo taken 06/13/15. Interstates 41 north & 94 west pass through the trumpet interchange (Exit 318) with the Airport Spur (Wisconsin 119) with four overall lanes. Two lanes separate in 0.75 miles for the Milwaukee Bypass (I-894). Photo taken 06/13/15. A collector distributor roadway separates Interstate 41 north from Interstate 94 west at Exit 317. The c/d roadway serves Layton Avenue in addition to I-43 south & 894 west at the Mitchell Interchange. Photo taken 06/13/15. Long distance travelers bound for I-94 west to Madison are directed onto Interstate 894 west to bypass Milwaukee. Fond du Lac was also highlighted for then U.S. 41 north. 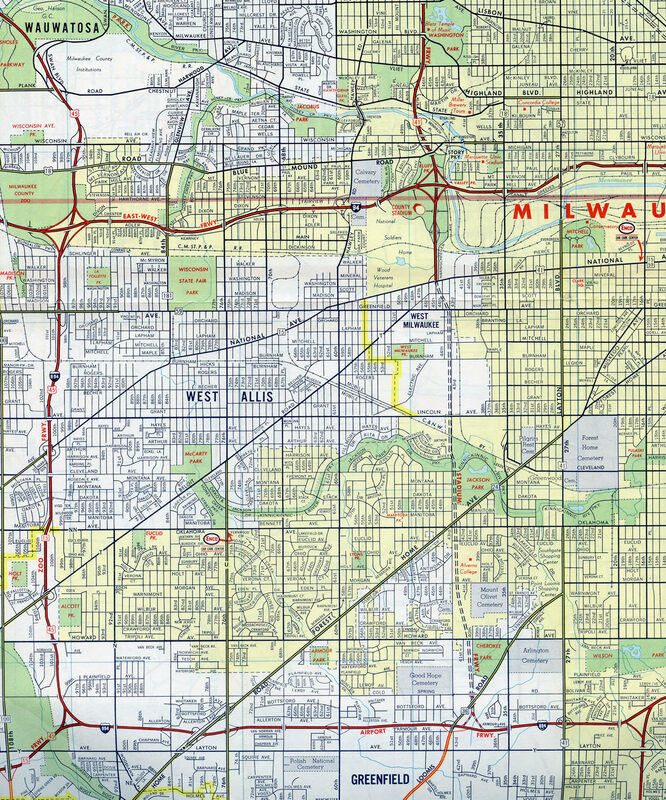 The control city is more relevant as Interstate 41 overlaps with all of I-894. Photo taken 06/13/15. The Exit 316 c/d roadway accommodates four overall lanes as it combines with the on-ramp from Wisconsin 119 (Airport Spur). Photo taken 06/13/15. The three-quarter cloverleaf interchange with Layton Avenue was reconfigured into a diamond as part of the Mitchell Interchange project. Another change involved the relocation of the 27th Street off-ramp, which is not accessible for motorists taking I-41 north from I-94 west. Instead they are directed onto Exit 316 for Layton Avenue west to make the connection. Photo taken 06/13/15. Interstate 41 turns west along a three-lane off-ramp to combine with Interstates 43 south & 894 west along the Airport Freeway. Two lanes continue north from the c/d roadway otherwise onto I-43 north & 94 west to Downtown Milwaukee. Photo taken 06/13/15. A tunnel takes Interstate 41 north below the I-94 mainline but above the I-43 northbound ramp to I-94 west. Interstates 41 and 43 overlap for 4.7 miles to the Hale Interchange. Photo taken 06/13/15. Interstate 94 west & U.S. 41 north previously encountered a left-hand ramp (Exit 316) for Interstates 43 south & 894 west two miles north of the diamond interchange (Exit 319) with College Avenue. Photo taken 09/02/05. Interstate 94 west & U.S. 41 north progressed beyond the trumpet interchange with the Airport Spur (Wis 119) one mile to the Mitchell Interchange. C/d roadways run north from Wisconsin 119 to the I-94 viaduct above South 13th Street now. Photo taken 09/02/05. This diagrammatic overhead sign provided the lane assignments for travelers on Interstate 94 west & U.S. 41 north as the North-South Freeway approached the junction with Interstates 43 and 894, the Airport Freeway. Two lanes were allocated for both movements, and today two remain for I-94 west while three depart for I-43 south & 894 west. Photo taken 09/02/05. The original Layton Avenue interchange included a single lane c/d roadway servicing dual ramps to the east-west arterial. Movements between Layton Avenue and the adjacent Mitchell Interchange were combined into a single system of c/d roadways. Photo taken 09/02/05. Notably, control cities for Interstates 43 south and 894 west were not referenced on Exit 316 signage. The first, Madison, is the destination for westbound Interstate 94. This reference was geared to helping through traffic avoid Downtown Milwaukee. The second control point, Fond du Lac, is located northwest of Milwaukee along the U.S. 41-45 corridor (now I-41) at the southern end of Lake Winnebago. Photo taken 09/02/05. Speed limits reduced to 50 miles per hour as Interstate 94 & U.S. 41 north entered the three wye interchange with Interstates 43 and 894. Painted chevrons lined the two left lanes as they veered onto I-894 west to Greenfield and West Allis while a ramp meter to the right concluded the former Exit 317 c/d roadway. Photo taken 09/02/05. The first sign for the Mitchell Interchange and split of Interstate 43 south from Interstate 94 east stands within the parclo interchange (Exit 314B) with Howard Avenue. Photo taken 06/13/15. Interstates 43 & 94 curve westward over South 6th Street on the one mile approach to back to back ramp departures at the Mitchell Interchange. Photo taken 06/13/15. Two lanes part ways with Interstate 94 east for the continuation of Interstate 43 south onto I-41 north & 894 west. I-41 south joins I-94 east for the remaining 32-mile drive to the Illinois state line. Photo taken 06/13/15. A viaduct takes Interstates 43 & 94 across South 13th Street, a culverted creek and an adjacent railroad line. The unnumbered ramp for Interstates 41-43-894 departs from the elevated roadway for Greenfield, West Allis and Beloit. Photo taken 06/13/15. Interstate 43 south combines with Interstates 41 north & 894 west to the Hale Interchange while a two-lane c/d roadway branches away from the Interstate 94 mainline for Layton Avenue, Wisconsin 119 (Airport Spur) and College Avenue. Photo taken 06/13/15. Interstates 43 & 94 originally carried just six lanes on the curve preceding the Mitchell Interchange. Five southbound lanes travel here now. Photo taken by Chris Lokken and Mike Saldivar (08/13/06). Passing over 15th Street, Interstates 43 south & 94 west split with two lanes remaining south along the North South Freeway and two joining the Airport Freeway west. Photo taken by Chris Lokken and Mike Saldivar (08/13/06). Entering the Mitchell Interchange midway during construction to modernize the three wye exchange. Photo taken 05/30/11. The first reassurance marker for I-894 stands within the median just beyond the South 27th Street overpass. Signs for I-41 were added in June 2015 along the outside lanes of the Airport and Zoo Freeways. Photo taken 06/13/15. Interstate 41 north & 894 west reach the Zoo Interchange with Interstate 94 just 0.75 miles north of the Greenfield Avenue (Wis 59) exit. Expansion of the Zoo Freeway here adds two lanes per direction for ten total. Associated work converted Exit 1D with Wisconsin 59 from a parclo to a diamond interchange. Photo taken 06/13/15. The former left-hand ramp (Exit 1B) to Brookfield, New Berlin and Waukesha closed permanently in early 2015. A new flyover opens by late 2015 for Interstate 94 west. Photo taken 06/13/15. Interstates 41 & 894 kink eastward to pass over Schlinger Avenue ahead of Interstate 94. All traffic will eventually depart in unison to the right for I-94 west to Madison and east to Downtown Milwaukee. Photo taken 06/13/15. Interstate 894 ends as Interstate 41 & U.S. 45 continue beyond Exit 1A for I-94 east toward Menomonee Falls, Germantown, West Bend and Fond du Lac. The two routes intermingle to Oshkosh, where U.S. 45 branches westward toward Michigan while I-41 remains to the east to Appleton and Green Bay. Photo taken 06/13/15. Two miles west of the Zoo Interchange along Interstate 94 (East West Freeway) after the Elm Grove Road overpass. These style of signs, which were erected around 2004 or so, are posted on every major freeway-to-freeway interchange in the Milwaukee area. Photo taken by Chris Lokken and Mike Saldivar (08/13/06). This diagrammatic sign was found on Interstate 94 eastbound at the exit ramp for Wisconsin 100. Wis 100 connects I-94 with the adjacent Milwaukee County Zoo. The State Trunk Highway constitutes a surface boulevard beltway encircling Milwaukee on a 270 degree loop. It merges with the Zoo Freeway on the northwest side, entering Waukesha County at Menomonee Falls. Photo taken 05/30/11. Exit 305A joins I-94 east with Interstates 41-894 & U.S. 45 south to West Allis, Greenfield and Hales Corners. U.S. 45 south splits with I-894 in four miles at the Hale Interchange. There I-43 merges with I-41 & 894 east along the Airport Freeway. Photo taken 09/02/05. Travelers leave I-94 east for I-41-U.S. 45 south & I-894 east to General Mitchell International Airport (MKE) and Chicago. 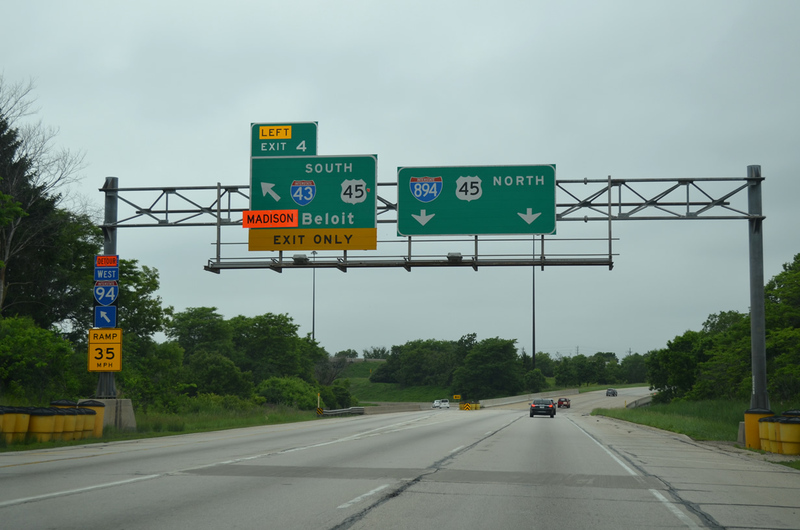 A left-hand ramp (Exit 305B) follows for Interstate 41 & U.S. 45 north to Wauwatosa, northwest Milwaukee, Menomonee Falls and Germantown. U.S. 45 overlaps with I-41 for 21 miles before separating to the east to West Bend. Photo taken 05/30/11. Interstate 41 runs north from Milwaukee to Fond Du Lac, Oshkosh, Appleton and Green Bay. U.S. 45 also serves Fond Du Lac and Oshkosh, but on a more local level and is not a freeway north of West Bend. Photo taken 09/02/05. This set of signs posted at the original ramp departure of Exit 305A for I-894 east & U.S. 45 south was replaced by 2011. Photo taken 09/02/05. Continuing on Interstate 94 eastbound, this was the ramp connecting to U.S. 45 north. The bridges above were part of the original Zoo Interchange, which was one of the busiest and most congested in the state of Wisconsin. Photo taken by Chris Lokken and Mike Saldivar (08/13/06). Two miles ahead of the Zoo Interchange with Interstates 41 and 894 east on Interstate 94 west at the split diamond interchange (Exit 307A) with 68th and 70th Streets. Photo taken 05/30/11. The next sign bridge on westbound Interstate 94 further delineated the lane assignments for the three routes. This stretch of freeway expands to five westbound lanes with an addition of a single lane distributor roadway from Wis 181. Photo taken 05/30/11. Interstate 41 south combines with I-894 east to the Hale Interchange, where I-43 north joins along the Airport Freeway leading east back into Milwaukee. Signs were updated in summer 2015 to reflect the changeover of U.S. 41 to I-41 between Pleasant Prairie at the Illinois state line and the north end of I-43 at Green Bay. Photo taken 05/30/11. The left-hand ramp for I-894 east & U.S. 45 south closed permanently in 2015. A new flyover, slated to open in late 2017, replaces the movement. Photo taken 06/13/15. This diagrammatic sign outlined the back to back ramps (Exits 305B/A) with the Zoo Freeway along I-94 west at exit for Wisconsin 181. Photo taken 09/02/05. The previous diagrammatic sign posted at Exit 306 was replaced with this one after 2010. It, in turn, was removed during the Zoo Interchange road work by 2015. Photo taken 05/30/11. Westbound Interstate 94 reached Exit 305B to then just U.S. 45 north. This set of signs was replaced by 2011. Photo taken 09/02/05. Continuing west, the left lane departed from Interstate 94 and connected to I-894 east and U.S. 45 south. The control point is Chicago, since it acts as a bypass of Downtown Milwaukee. However, the route also connects to Interstate 43 southwest to Beloit, where it connects to Interstate 39, which travels south into central Illinois. I-39 offers an excellent bypass of the Chicago metropolitan area en route to St. Louis and points south via I-57, I-24, and I-55 (including Little Rock, Nashville, and Memphis). Photo taken 09/02/05. Exit 40 with Watertown Plank Road was greatly expanded to include directional and loop ramps to Interstate 41 & U.S. 45 by late 2014. The freeway proceeds south from here directly to the Zoo Interchange with I-94 and I-894 east. Photo taken 06/13/15. Construction associated with the Zoo Interchange project straightens out the Interstate 41 & U.S. 45 approach to Exits 38B/A with Interstate 94 (East West Freeway). This scene looks south ahead of the U.S. 18 overpass. Photo taken 06/13/15. The left-hand ramp (Exit 38A) for Interstate 94 east to Downtown Milwaukee will be replaced by a new flyover ramp. Work in this scene resulted in a new diamond interchange and overpass for U.S. 18 (Bluemound Road). Photo taken 06/13/15. Interstate 94 eastbound traffic for Miller Park and Downtown Milwaukee departs via a single lane ramp from the left. Traffic traveling west towards Waukesha and Madison will depart next, but from the right. Photo taken 06/13/15. Interstate 894 begins as Interstate 94 westbound traffic departs. Interstate 41 & U.S. 45 remain south along the Zoo Freeway to the Hale Interchange with Interstate 43 (Rock Freeway). Photo taken 06/13/15. Traveling through the original diamond interchange with Watertown Plank Road, motorists along U.S. 45 south passed by the one mile guide sign for the Zoo Interchange. A major rebuild of this exit took place to late 2014, with expansion of the freeway and several new directional and loop ramps added. Photo taken by Chris Lokken and Mike Saldivar (08/13/06). Continuing south on U.S. 45, this diagrammatic sign was posted just north of the Wisconsin Avenue overpass. Ramps once joined both Wisconsin Avenue and parallel U.S. 18 (Bluemound Road) here. Photo taken by Chris Lokken and Mike Saldivar (08/13/06). A pair of lane drops occurred just south of the original U.S. 18 (Bluemound Road) overpasses along U.S. 45 south at the Zoo Interchange. Photo taken 05/09/10. A look at the Zoo Interchange and ramp departure of Exit 38B to I-94 west prior to reconstruction. Photo taken by Chris Lokken and Mike Saldivar (08/13/06). Interstate 894 (Chris Bessert) – visit Chris’s excellent page for more information on the co-signed section of Interstate 43 and Interstate 894 as well as information on the history of Interstate 894. Chris also notes a discrepancy in total mileage of Interstate 894 (including the Interstate 43 overlap): the Wisconsin Department of Transportation records show 9.92 miles in length. “Norquist freeway plan diverts traffic.” Milwaukee Journal Sentinel, January 23, 2003. “Ribbon cutting held for completed Mitchell Interchange project.” Fox6 (Milwaukee), November 9, 2012. “Short-term closure: Hale Interchange ramp to WIS 100 to close Monday, July 6th.” Fox6 (Milwaukee), July 2, 2015. “Scott Walker declares Zoo Interchange is done, even as years of work remain.” Milwaukee Journal Sentinel (WI), August 28, 2018. Page updated January 22, 2019.